Marjorie Harris Carr Cross Florida Greenway (Fla.
A newspaper article by Captain Charles Henry Coe (1856-1954) regarding the Cross Florida Barge Canal, also known as the Marjorie Harris Carr Cross Florida Greenway. In 1935, President Franklin D. Roosevelt (1882-1945) allocated $5 million to construct a canal that would link the Atlantic Ocean to the Gulf of Mexico. Construction was cancelled a year later due to strong opposition from some locals. In 1942, the canal project was reauthorized. In the article, which was published on April 12, 1942, Capt. Coe makes a number of arguments against the construction of a new canal. 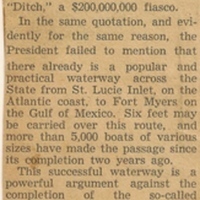 According to the author, there was already a waterway cutting across the state of Florida from the St. Lucie Inlet to Fort Myers. The project did not continue, as the United States Army Corps of Engineers (USACE) never received the funds to begin construction. Attempts to complete the project again resurfaced in 1963 and construction recommenced the following year. However, the project was again halted in 1971 and the project was officially cancelled in 1991. In 1998, the canal was renamed the Marjorie Harris Carr Cross Florida Greenway, in honor of Marjorie Harris Carr (1915-1997), who was a leading opponent of the project. Original newspaper article: Coe, Charles Henry. "Cross-Florida Waterway." The Palm Beach Post, April 12, 1942: Private Collection of Andrew M. Foster. Digital reproduction of original newspaper article: Coe, Charles Henry. "Cross-Florida Waterway." The Palm Beach Post, April 12, 1942. Noll, Steven, and David Tegeder. Ditch of Dreams: The Cross Florida Barge Canal and the Struggle for Florida's Future. Gainesville: University Press of Florida, 2009. Noll, Steven and M. David Tegeder. "From Exploitation to Conservation: A History of the Marjorie Harris Carr CrossFlorida Greenway." United States Nuclear Regulatory Commission. http://pbadupws.nrc.gov/docs/ML1204/ML12044A397.pdf. Coe, Charles Henry. “Cross-Florida Waterway.” RICHES of Central Florida accessed April 19, 2019, https://richesmi.cah.ucf.edu/omeka/items/show/6195.